I am getting ready to buy my first Rolex. 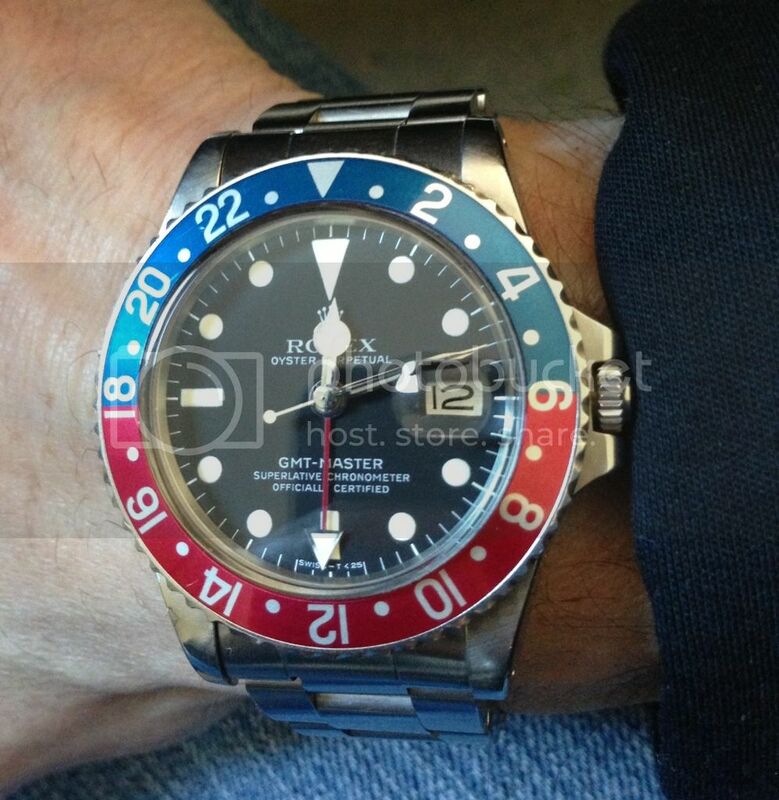 I have decided on the 1675 GMT (Pepsi). Would this be a good choice? I am looking for something that would have collectors value. ..to enjoy wearing it every day, and because you like the watch. Nothing else is guaranteed and nothing else matters. Mine says hello. Kind regards, -Rick. The 1665 is an excellent watch. What I like about it is that it's like getting an ultra cool 5513 (with the maxi dial and super dome crystal), *plus* the added functionality of the date. You can't go wrong with this watch. That is a beauty Rick! That is a beautiful watch as are the 1675. I will look into both some more make sure I make the correct decision. I am also deciding on a first vintage piece. Which is more rare: 5513 or 1665? Are the approximately the same price if both were in excellent condition? The 5513 was also my first Rolex, it's such a great watch. In my foolish youth, I sold it to get a 14060, but now I wish I still had it. When you get whatever you decide on, just make sure you post photos! The better GMTs for collector value are the early gilts, but iirc there are non hacking pre 1971 examples, and the farther back you go you get to the small hand examples. Mid sixties, I think. I have a later hacking 1575 example, but earlier would probably be better for collectibility. My examples been kinda flat while the gilts have really risen. "Chronographs, like most finer things in life, only improve with time..." - In memory of Chuck Maddox. Forgot to say the 1665 has the advantages of both a 1680 for the date and the 5513 for the look. 5513s are the Bauhaus Rolex, classic for their symmetry. With a 1665 you get the date and no cyclops. You can remove the cyclops from a 1680 but not as a stock look. The 1665 has both. Previous Topic: 5513 - I think my search is over. Next Topic: 18Kt. #4467 coin edge bezel "left hand wind"